Very excited to see the new PowerPoint functionality! I have another chart you may want to add to your “under consideration” list. I’ve been working on a project that involves a lot of associative statistics. We’ve been playing with Sankey charts to display adjacencies between products. I find they doe a really good job communicating the interactions between products and how customers move through certain clusters. 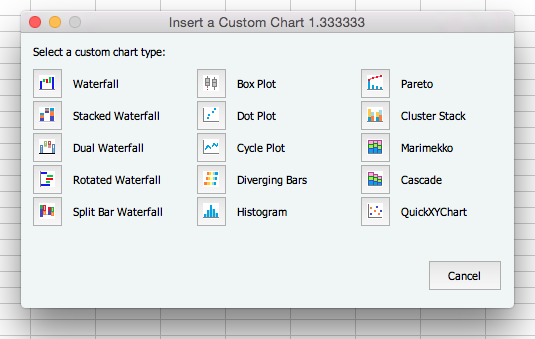 At the moment, we use an add-on module in R to product the Sankey charts. It would b nifty to see if they can be produced in Excel. File not found error when clicking on the link to the file above. Working great for me so far in Windows 8 / Office 2016. I really like the idea of a GANTT chart, and I would be interested in the PowerPoint version as well. Excellent time saving utility – thank you for creating it! Sorry, the uploaded file had an underscore instead of a hyphen. I hate when I do that. Thanks for the feedback. I’m very slowly adding features. It takes much longer than I would have expected…. Thanks for your suggestion. According to Microsoft, the majority of suggestions for new features are for things that an application can already do. The Cycle Plot has been part of the Advanced Chart Utility since it was first released over a year ago. Below is a screenshot showing the Cycle Plot button on the Peltier Tech ribbon of the new Beta, with some dummy data and the chart produced by the utility. I didn’t realize that it’s already in the advanced utility…I will download soon! A bunch of minor internal improvements have been made, which you’ll probably never notice. A major new feature is included, a Grouped Box Plot. 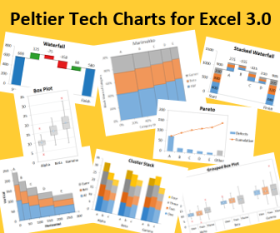 Box Plots are great, and a grouped box plot is kind of like a clustered column chart, with a few color-coded subcategories of data each clustered together on a few categories. 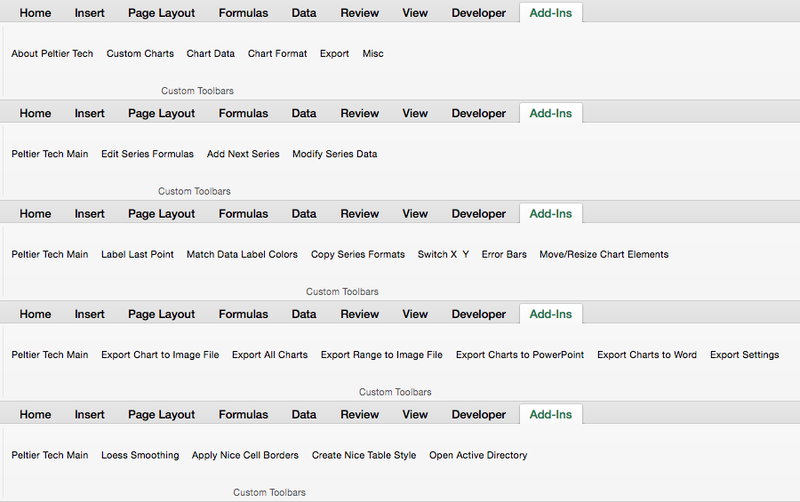 Hi – latest beta crashes on execution, creates the new worksheet with data, but no charts. Running Office 2016 on a mac. My testing in Mac Excel 2016 has been incomplete. What feature were you using, and could you share the workbook that experienced the problem? Send it to jon at peltiertech dot com. Hi – the beta has expired, and I did not see a link for v3 of the utility. Could I please get another short-term release if the final version is still being worked on? I love your blog … I have benefited on many occasions from your posts, so thank you. 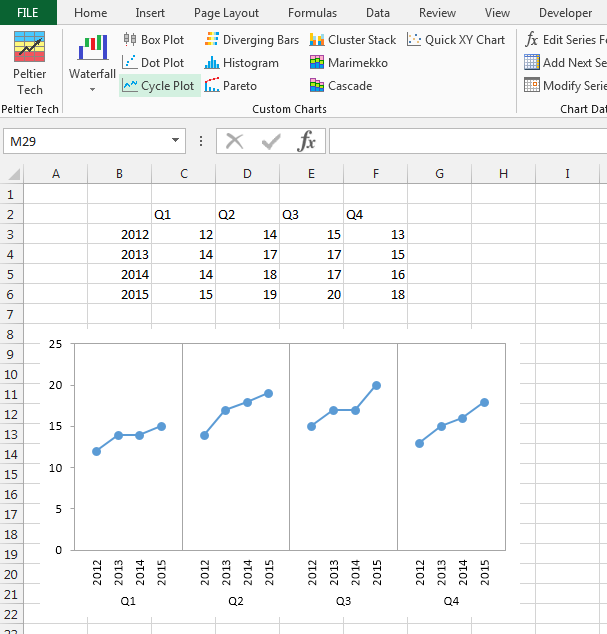 I cannot find a method to automatically eliminate a “0” data label from my charts. Consequently, I’m left to manually eliminate the select labels with null values while leaving other data values, which is a problem when the chart is updated. Is there a way to automate the elimination of null data labels?